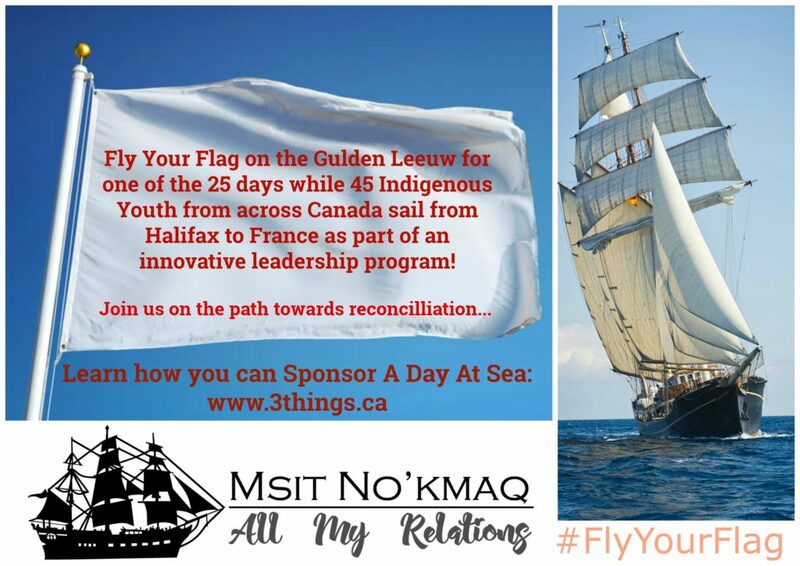 We invite your company, organization or Nation to support a diverse team of 45 Indigenous youth comprised of 15 and 24 year old First Nation, Inuit and Metis young people who will cross the Atlantic Ocean this August as part of Msit No’Kmaq: All My Relations, a tall ship youth leadership program. Meet these young warriors at https://3things.ca/the-warriors/. Each of the 25 days we will raise a flag that will wave in the wind, honouring and celebrating the sponsor of that day at sea. In turn, the funds raised will be used to support the celebration and honouring of the youth and their experience as they arrive in Le Havre, France and their visit to the Vimy Memorial. As they land in France we will have leaders welcoming them, a traditional ceremony and reception, allowing locals and other special guests to meet these amazing young people and hear about their experience first-hand. In addition to paying respect to all who fought in World War One, on their day trip to Vimy Ridge, special attention including ceremony will take place honouring the estimated well over 4,000 Indigenous soldiers who voluntarily enlisted in the Canadian military at that time. Like their ancestors, these young adventures who took part in a rigorous application and selection process demonstrated bravery and courage in accepting the challenge to sail by tall ship across the ocean. You can help shine a light on this exceptional group of change makers, and with your $2500.00 contribution the youth will fly your corporate (or other of your choosing) flag at the beginning of the day, take photographs of it sailing and share it via social media (and a hard copy for you upon arrival) and within a video at the completion of the project highlighting the #FlyYourFlag Champions. All sponsors will be recognized during these events, in social media and online. Contact youmatter@3things.ca for more information or to pledge your support and to be a #FlyYourFlag Champion! Download the #FlyYourFlag for Msit No’Kmaq All My Relations Package for more information.